This color combination appears in animals that inherit a Wilson white gene from one parent and at least one Tower beige gene from a parent. If a pink white is born from a pink white paired to a hetero beige, they can be homo beige pink whites which exhibit a creamy, slightly off-white coat and pale pink eyes, but rarely exhibit any homo beige markings. The white gene is dominant to the beige gene and will express over it, however, due to mosaicism, some pink whites can exhibit more beige throughout their coat. Also, due to the beige gene's influence on the offspring, they have pink ears, pink feet and red eyes. This oddity in eye color along with their typically all white coat makes this coloration commonly mistaken for albino. They are not, however, an albino coloration as albinism is a lack of pigment production and a pink white does in fact produce pigment. Left bottom photo courtesy of Elisa Anne, top center photo courtesy of Kristy at ABC Chinchillas and top right photo courtesy of Ashleigh of Golden Chinchillas. This is a cross between Tower beige and ebony. The ebony gene works in a way with other colors that it will create a "wrapped" effect of the coloring. This means that colors that would normally have a white belly now have continuous coloration from the back to the belly. When this occurs in beige, it is commonly referred to as a tan or a beige wrap. They can range from light to extra dark. Chocolates would also be classified in this group, but don't mistake a dark tan for a chocolate. A true chocolate is almost black in color (like dark chocolate) and does not show much brown in the coat. Chocolates are very rare since they are very difficult to breed for, so the chances of anyone in the general public owning a true chocolate are slim to none. More than likely if someone sold a "chocolate" it is just a dark tan which they tried to make sounds more rare and exotic by calling it a chocolate. Left photo of young light tan courtesy of Sunshine Chinchillas, left bottom photo courtesy of Golden Chinchillas, center center photo courtesy of Brenda's Cherished Chinchillas, center bottom photo courtesy of Bobbie Schultz, right top photo courtesy of Angel's chinchillas, and bottom right photo courtesy of Sunset Chinchillas. This is a cross between Tower beige and Gunning black velvet. TOV stands for "Touch of Velvet" which refers to the presence of the Gunning black gene. Animals that inherit the TOV gene will inherit the dark mask and dark veiling exemplary of this trait. Some people insist that paw stripes or spats are indicators of TOV when in fact they are not. 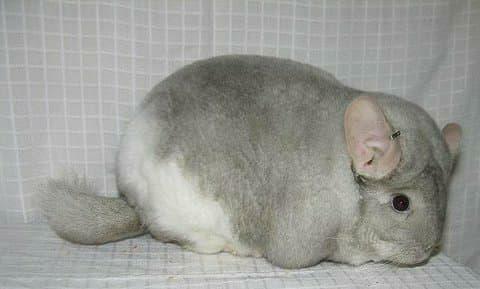 Paw tripes or spats can be found on most chinchillas. The brown velvet is usually a darker beige because of the influence of the darker black velvet gene. 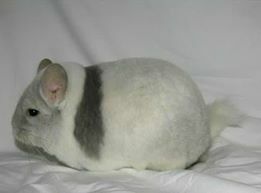 They start with the darkest line being the grotzen and it fades to a lighter beige on the sides with a pure white belly. Since the beige gene is present, they exhibit the pink ears, pink feet and reddish brown eyes associated with that gene. This is a cross between Tower beige and Afro violet. 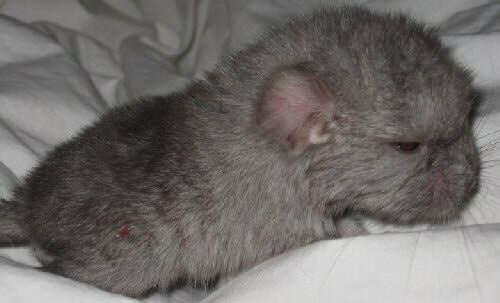 This animal must be homozygous for violet (meaning both parents passed down a violet gene), but only requires one beige gene. The terms beige violet and pearl beige are used interchangeably, though the term beige violet is more commonly used in the United States and pearl beige is more commonly used in the United Kindgom and much of Europe. This color appear as a light beige with a more blueish hue due to the influence of the violet coloration. 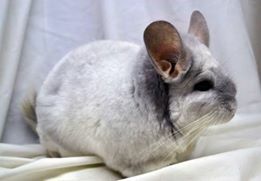 If well bred, this can create a very desirable and soft looking beige, but when bred poorly the animals have weak fur and are an odd orange coloration. 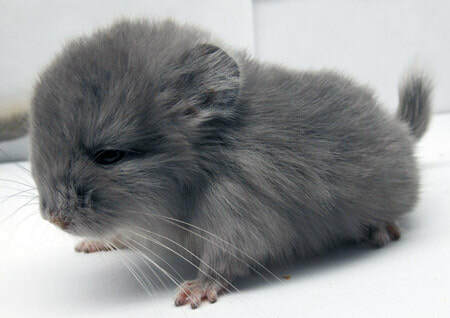 Left photo courtesy of qualitymutationchinchillas.com (Ridge Chinchillas), right photo courtesy of Bobbie Schultz. This is a cross between Tower beige and Larsen sapphire. This animal must be homozygous for sapphire (meaning both parents passed down a sapphire gene), but only requires one beige gene. 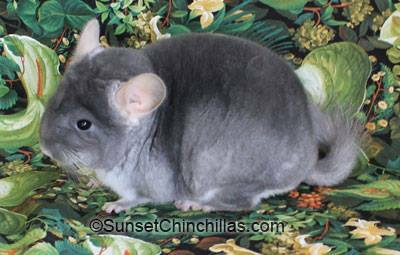 This is a very light beige that has an almost silvery sheen to the fur due to the presence of the gun metal sapphire gene. 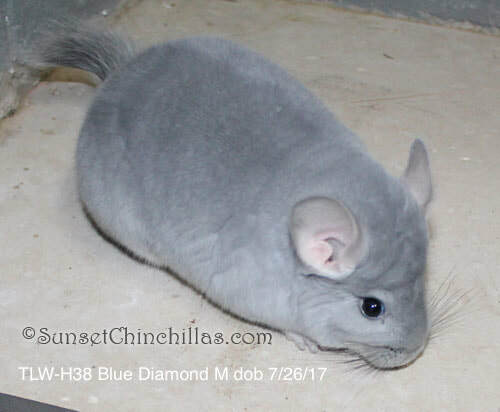 These animals can be appealing, but the sapphire gene alone has a lot of work to improve the overall quality of the mutation and mixing these two colors preemptively can leave you with very poor quality, weak furred animals. 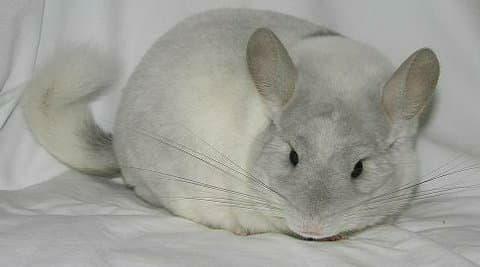 It's best to leave the breeding and improvement of this coloration in the hands of more experienced breeders. 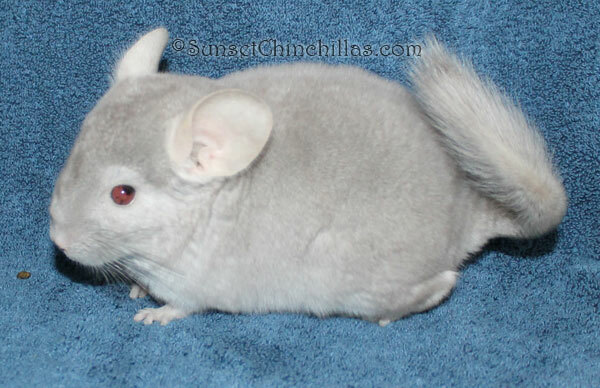 Also, as noted by Sunset chinchillas, this color combination produces a very interesting starburst pattern on the eye. This is a distinguishing feature for a beige animal that is also homozygous for sapphire. 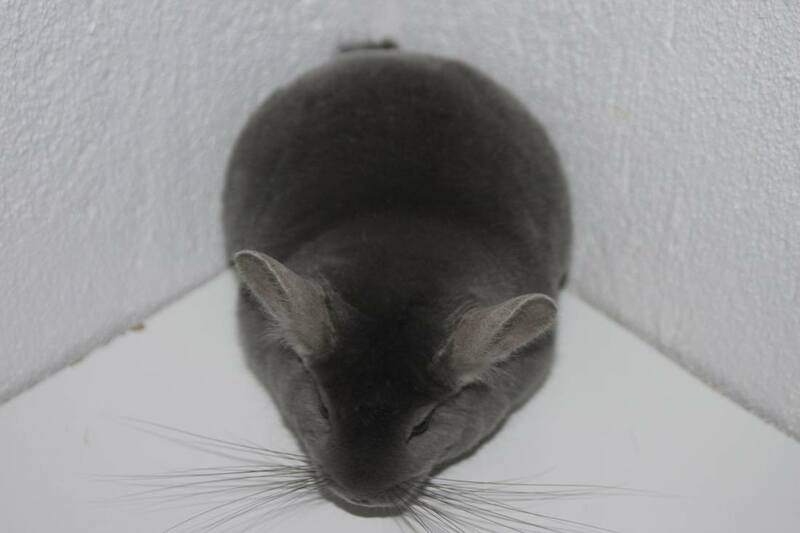 Left photo courtesy of Bobbie Schultz, other three photos courtesy of Sunset Chinchillas. This is a cross between white and ebony. This mix is not much different phenotypically than other mosaics. Some may exhibit darker black markings that truly show the ebony color, but others show normal mosaic markings. The ebony fur has a different length and texture than the mosaic fur, so often this color combination does not do well on the show table as the judges look for an even fur pattern. When this color throws neatly marked kits, they are highly desirable on the pet market. The only way to tell a white ebony from a mosaic is to either have the genetic history of the animal, if the animal's coloration extends onto the belly, or if the animal is bred to a pure standard and produces an ebony kit. Top left photo courtesy of Golden Chinchillas, bottom left and bottom center photos courtesy of Puseliten's Chinchillas, top center and top left photos courtesy of fluffy chins, and bottom right photo courtesy of Humble Acreas Chinchillas. This is a cross between Wilson white and Gunning black velvet. Since the white gene is an incomplete dominant gene, it can completely mask the presence of the TOV gene. 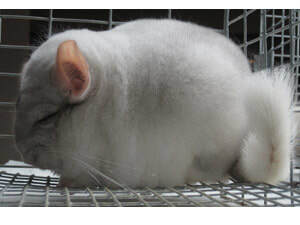 Often, it is difficult to tell if a mosaic kit has the TOV gene. 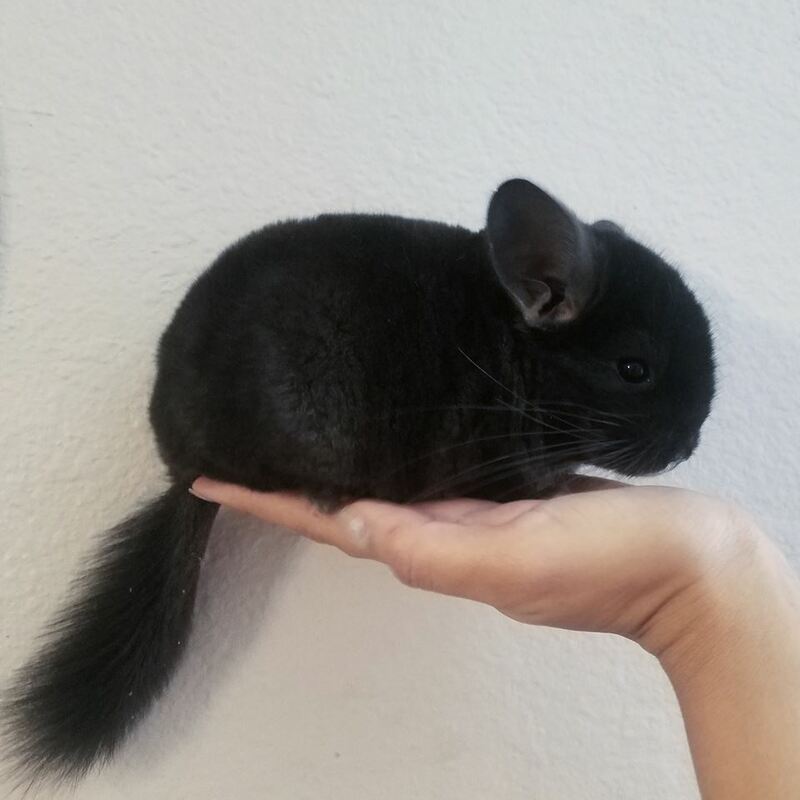 The only way to tell if a mosaic kit has the TOV gene (remember it is a dominant gene so it cannot be carried) is a combination of the background of the animal (one parent must be black velvet or proven to have the TOV gene) and if the chinchilla throws a black velvet kit or obvious TOV kit. TOV whites can be very appealing and often do well on the show table. 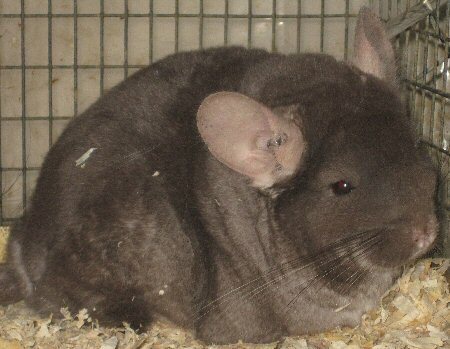 Left photo courtesy of Ohio KPC Chinchillas, right two photos courtesy of Bobbie Schultz. This is a cross between Wilson white and Afro violet. The violet must be in the homozygous state (meaning both parents must contribute one violet gene) and the white, being a dominant gene, needs only one copy to show through in the phenotype. While this color can be very appealing, often it is hard to produce one that not only shows clear coloring in the violet spots, but also clear coloring in the white spots. This color is not rare, but quality bred white violets are hard to find. Bottom left photo courtesy of Bobbie Schultz, bottom center photo courtesy of Humble Acres Chinchillas and right two photos courtesy of Golden Chinchillas. This is a cross between Wilson white and Larsen sapphire. The sapphire must be in the homozygous state (meaning both parents must contribute one sapphire gene) and the white, being a dominant gene, needs only one copy to show through in the phenotype. This combination could possibly show promise in the future. As of right now, because the sapphire mutation has been weakened over the years through poor breeding (the sapphire was a "new" color and the demand for it was high, leading to low quality breeding for faster production), this combination is small and weak. Breeders looking to improve sapphires will work mostly with sapphire and pure standards, but a few are known to dabble with one or two white sapphires. Photo courtesy of Bobbie Schultz. 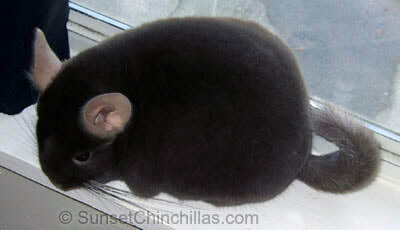 ​This is a cross between ebony and Gunning black velvet. This cross is difficult to tell phenotypically. Since the ebony is usually so dark, it is hard to tell a TOV ebony from a hetero ebony. Usually, a TOV ebony can be identified by a full mask over the face. Most hetero ebonies do show some lighter coloration on the face. This cross can make a very strong ebony variation. Photos courtesy of Chinchilla Chateau. This is a cross between sapphire and ebony. 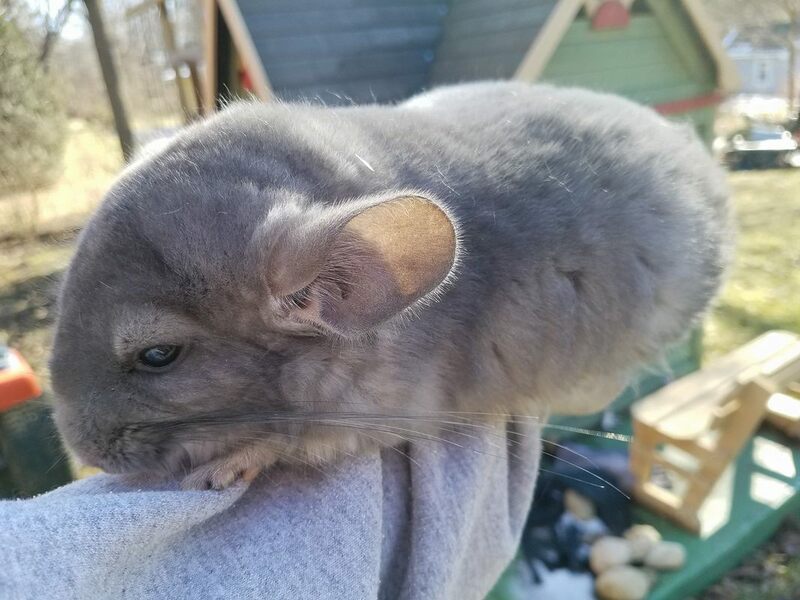 This cross must be homozygous for sapphire (meaning each parent must contribute a sapphire gene) and only requires one parent exhibit the ebony gene. This color shows through as sapphire and the ebony gene will manipulate how dark the sapphire shows through and there will be no white belly as the ebony gene will cause the sapphire color to wrap around onto the belly. 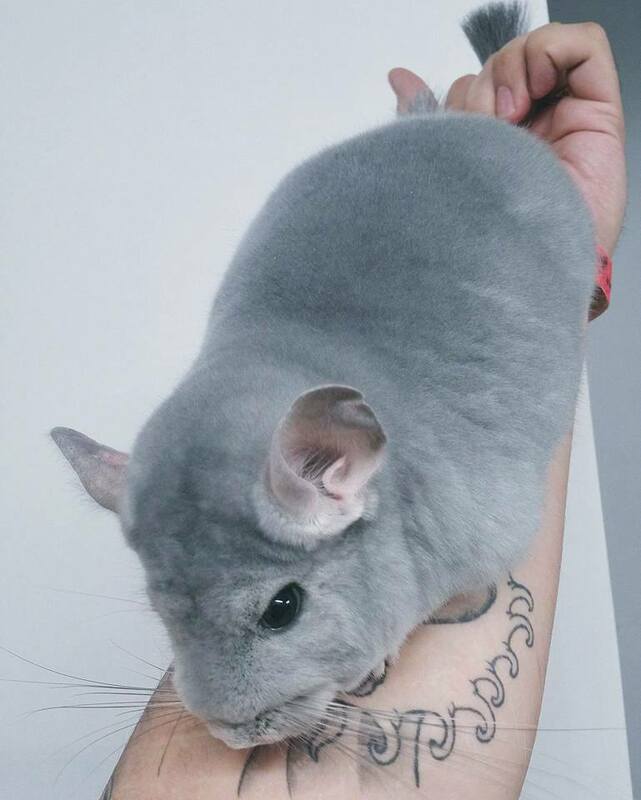 For the best sapphire wraps, they can be purchased through chinchillas.com, but be warned, these beauties come at a high price! 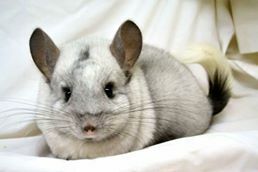 Photos courtesy of chinchillas.com. This is a cross between sapphire and black velvet. The sapphire must be in the homozygous state (meaning both parents must contribute one sapphire gene) and the black velvet, being dominant, only needs on gene to show through in the phenotype. This color is usually a darker sapphire color with a dark mask and sometimes darker veiling down the back. Left and right photos courtesy of Sunset Chinchillas, center top photo courtesy of Ohio KPC Chinchillas, center bottom photo courtesy of Bobbie Schultz. This is a cross between Afro violet and ebony. The violet must be in the homozygous state (meaning both parents must contribute a violet gene) and the ebony only need to come from one parent. 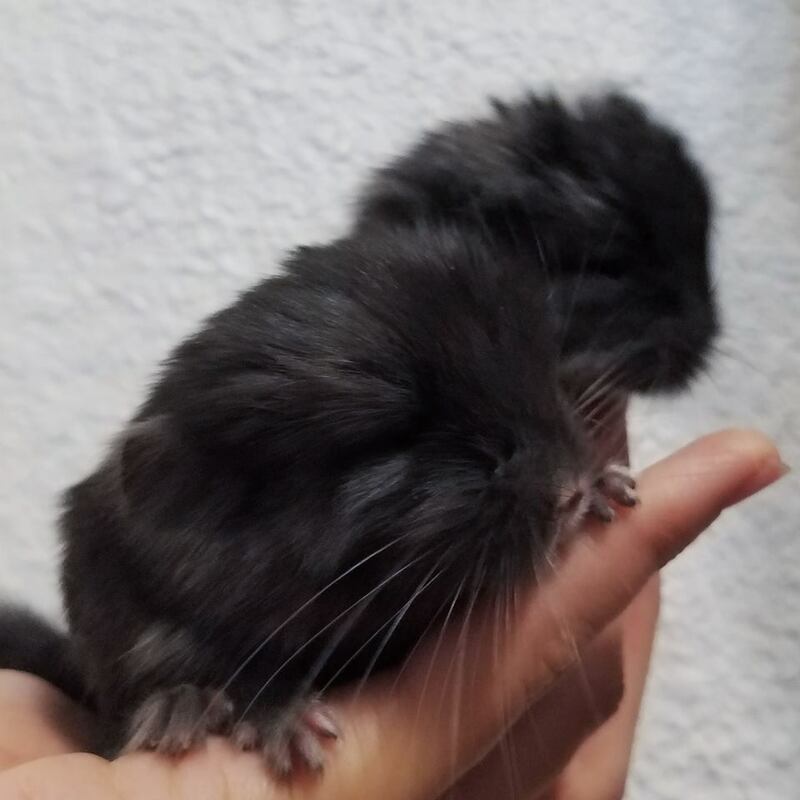 The ebony gene makes the violet color darker and eliminates the white belly by causing the violet coloration to wrap to the belly. This color can be a beautiful and vibrant purple hue, but if poorly bred, they can look muddy or orange. 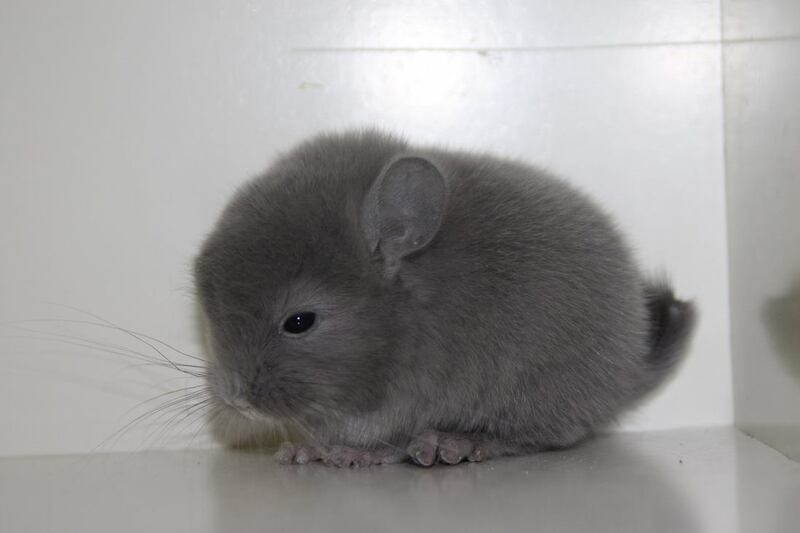 This color needs to be carefully bred as violets tend toward looser fur which the ebony gene can increase if proper consideration is not taken into their breeding. 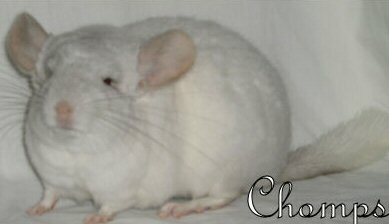 Bottom right photo and right photo courtesy of Puseliten's Chinchilla, middle top photo courtesy of Bobbie Schultz, and bottom center photo courtesy of ABC Chinchillas. This is a cross between Afro violet and Gunning black velvet. 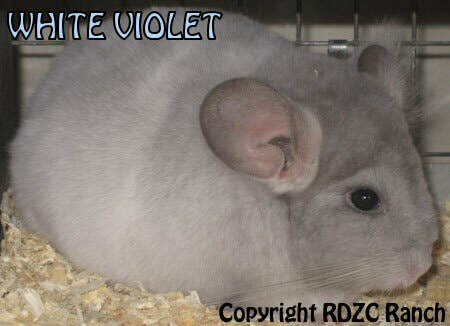 The violet gene must be in the homozygous state (meaning both parents must contribute a violet gene) and only parent needs to contribute a black velvet gene. This color gives a stunning contrast between a deep, dark violet coloration on top and a bright white belly. They exhibit the mask from the black velvet gene and also darker veiling down the back. Like any color involving a recessive gene, careful consideration needs to be taken in breeding this color. 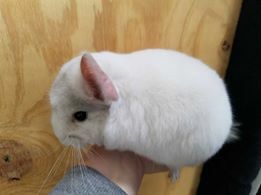 Photo courtesy of Humble Acres Chinchillas. This color is traditionally a combinationt between Afro violet and Larsen sapphire, though there are some now that are crossed with German Violet. This color varies greatly depending on the influence of the violet and sapphire lines. Some appear so light that they are an almost silvery white coloration and some are a deep blue color, but all exhibit an almost ethereal glow. 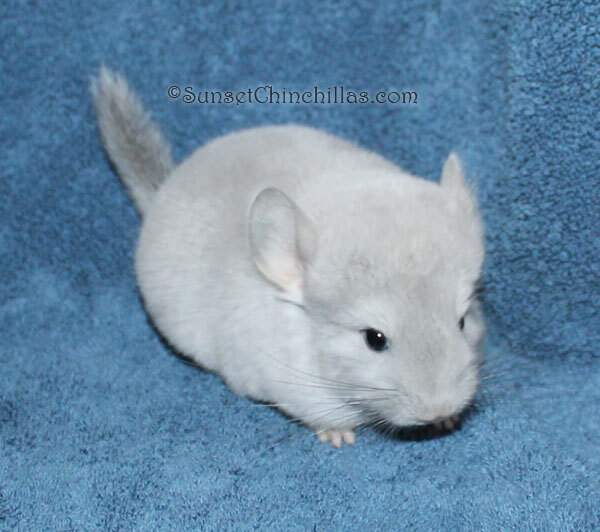 This is a coloration with a lot of eye appeal and potential, but is difficult to breed as it is a double recessive. Breeders working with this mutation regularly outcross to standards to strengthen the lines. 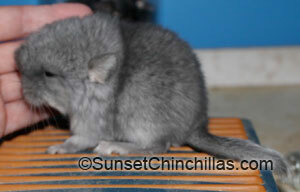 Left two photos courtesy of Sunset chinchillas and the right photo is courtesy of Manalo Chinchillas.